Pedal Thru The Pines is an annual on-the-road cycling event that benefits the Family Crisis Center. This year, Pedal Thru The Pines will be held on Saturday, Mar. 9th, in Bastrop and Buescher State Parks. The race begins at 9am at Vernon L. Richards Riverbend Park, located at 107 Hwy 71 W in Smithville, TX. 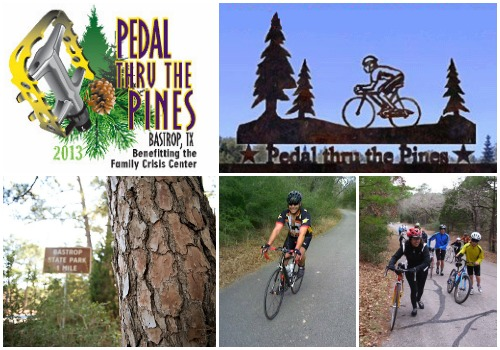 Pedal Thru The Pines is a recommended training ride for the BP MS150, and participating cyclists may choose from routes of 17 miles, 27 miles, 47 miles, or 62 miles. Click here for route maps. Registration is $45/rider. To register, click here. Online registration closes Thursday, Mar. 7th, at 11:45pm. For more information, visit http://pedalthrupines.org.